Chamomile is one of the most ancient medicinal herbs known to mankind. Many different preparations of chamomile have been developed over the years, and the most popular is in the form of herbal tea, with more than 1 million cups consumed per day. 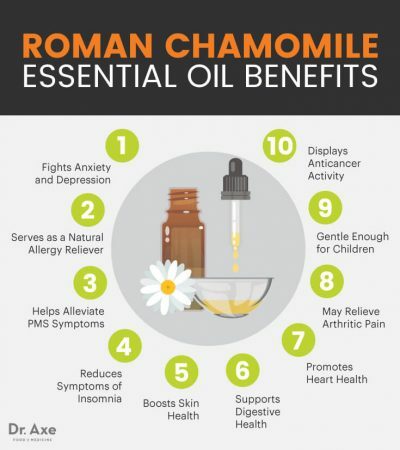 (1) But many people don’t know that Roman chamomile essential oil is even more effective than tea and just as easy to use. You can get all of the chamomile benefits from its essential oil by diffusing it at home or applying it topically to the skin, including its ability to calm the mind, relieve digestive issues, treat skin conditions, reduce inflammation and more. Roman chamomile possesses antimicrobial and antioxidant properties, and it’s commonly used for hay fever. It has the power to relieve mucus congestion, irritations, swelling and skin conditions that are associated with seasonal allergy symptoms. When applied topically, Roman chamomile oil helps relieve skin irritations that may be due to food allergies or sensitivities. Chamomile is used traditionally for numerous gastrointestinal conditions, including digestive disorders. Roman chamomile essential oil contains anodyne compounds that are antispasmodic and can be used to treat or relieve digestive issues, such as gas, leaky gut, acid reflux, indigestion, diarrhea and vomiting. It’s especially helpful in dispelling gas, soothing the stomach and relaxing the muscles so food can move through the intestines with ease. (9) Because of its relaxing properties, Roman chamomile can also be used internally and topically to get rid of nausea. Roman chamomile provides cardiovascular protection because of its high levels of flavonoids, which have been shown to significantly reduce mortality from coronary heart disease when taken internally. (10) Because of the flavonoids present in Roman chamomile essential oil, it may lower blood pressure and have a relaxing effect on the heart. For centuries, mothers have used chamomile to calm crying children, reduce fevers, eliminate earaches and soothe upset stomachs. It’s often called the “kid calmer” because of its ability to help children with ADD/ADHD, and it’s one of the gentlest essential oils on the planet, making it great for infants and children. In addition to these Roman chamomile essential oil benefits, preliminary research suggests that chamomile may also help treat hemorrhoids, have a protective effect on pancreatic beta cells in diminishing hyperglycemia-related oxidative stress, relieve symptoms of vaginitis (vaginal inflammation), treat the common cold, and relieve sore throat and hoarseness. To fight anxiety and depression, diffuse 5 drops, or inhale it directly from the bottle. To improve digestion and leaky gut, apply 2–4 drops topically to the abdomen. When diluted with a carrier oil like coconut oil, it can even be used in low doses for children with colic and diarrhea. For a restful sleep, diffuse chamomile oil next to bed, rub 1–2 drops onto the temples or inhale it directly from the bottle. To help calm children, diffuse Roman chamomile oil at home or dilute 1–2 drops with coconut oil and apply the mixture topically to the area in need (such as the temples, stomach, wrists, back of neck or bottoms of the feet). To promote heart health, apply 2–4 drops topically over the heart or take internally by placing it under the tongue. To ease nausea, inhale Roman chamomile directly from the bottle, or combine it with ginger, peppermint and lavender oil and diffuse. It can also be used topically on temples to help with nausea. 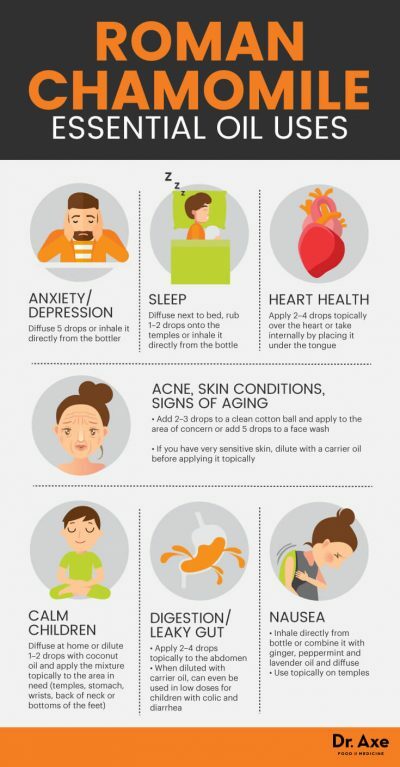 When using any essential oil internally, only use very high-quality oil brands that are 100 percent pure grade and made by a reputable and trustworthy company. Chamomile is one of the oldest, most widely used and well-documented medicinal plants in the world and has been recommended for a variety of healing applications. Chamomile plants are a member of the Asteraceae/Compositae family. There are two common types of chamomile used medicinally today: German chamomile (chamomillarecutita) and Roman chamomile (chamaemelumnobile). Although it’s called “Roman” chamomile, its history as a celebrated and widely used herb extends far beyond Ancient Rome. Hieroglyphic records show that chamomile was used cosmetically for at least 2,000 years. Greek physicians prescribed it for fevers and female disorders. And although “Roman chamomile” was not the official name of the plant at the time, the term was given after it was seen sprouting around the Roman Colosseum in the 19th century. Also, historically, chamomile has been the essential oil of choice for mothers to use with their children because of its gentle and calming properties. Chamomile was first cultivated in large quantities to be sold around the 16th century. Romans used chamomile to flavor drinks and in incense, as well as a medicinal herb to fight disease and promote longevity. Its healing qualities spread throughout Europe, and eventually the British brought chamomile plants to North America. Because Roman chamomile oil is an emmenagogue, which means that it stimulates blood flow in the pelvic area, it should not be used during pregnancy. When you use chamomile oil internally, do it for up to two weeks at a time and use only the highest quality essential oil. Chamomile is one of the oldest, most widely used and well-documented medicinal plants in the world and has been recommended for a variety of healing applications. Some Roman chamomile essential oil benefits include its ability to reduce inflammation, relieve depression and anxiety, soothe muscle cramps and other PMS symptoms, treat skin conditions, and boost heart health. Roman chamomile oil can be diffused at home or in your office, applied to the skin topically, and taken internally for up to two weeks at a time. When it’s time for bed, Chelsea and I love to diffuse a blend of Roman chamomile and lavender to help us wind down and get a great night’s sleep.